Our Daily Bread Bakery & Bistro presents their 2018 Bastille Day Celebration Buffet on Saturday, July 14, 2018. Enjoy the Bastille Day Buffet featuring French wine, food, entertainment and live music throughout the buffet from multiple performers! The cost is $29.95 per person and includes two glasses of French wine. There will be no reservations. Wear a French beret and get a $5.00 gift certificate. 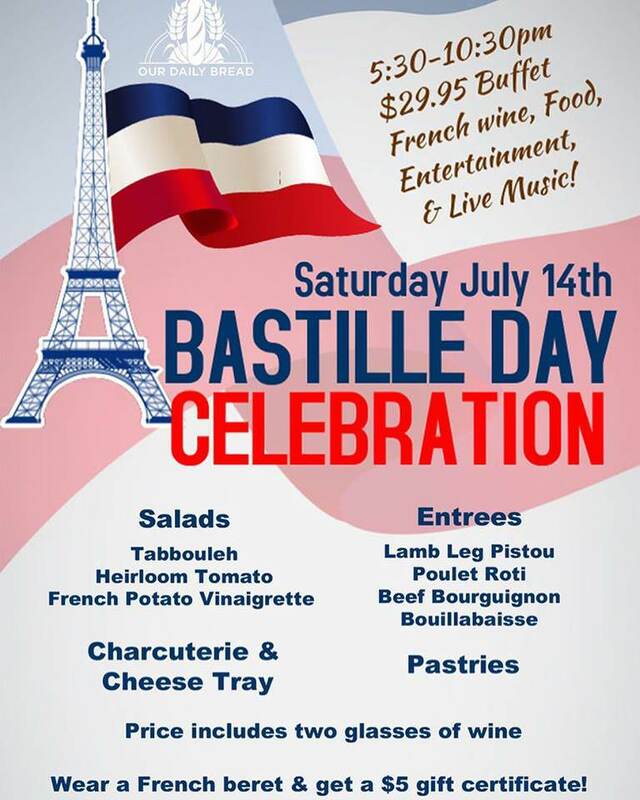 In addition to the Bastille Day Buffet, there will be fun activities, entertainment and specials all day long. For more information, visit: http://www.nextthreedays.com/FeaturedEventDetails.cfm?E=478384. To view the Buffet flyer, visit: https://i.imgur.com/Glu1vnU.jpg. For more information, visit: http://www.odbb.com/ or https://www.facebook.com/events/2069686509980496/ or https://www.facebook.com/ODBBlacksburg or call 540-953-2815.